NETWORK FINALS: CBS’s NCAA TOURNAMENT coverage adjusted to 1.3/1.1/1.9 from the initial 1.7/1.5/1.6. Elsewhere, SLEEPY HOLLOW gained a much-needed 0.1 in final numbers, while the rerun VAMPIRE DIARIES lost the same. CABLE HIGHLIGHTS: TBS’s NCAA TOURNAMENT Sweet 16 coverage took the top slots on Friday cable, led by 1.68 for the late game. Adult Swim’s CHILDRENS HOSPITAL downticked to 0.50. Disney’s morning slate was solid, with LION GUARD up 0.08 to 0.45, SOFIA THE FIRST at 0.44, and DOC MCSTUFFINS steady at 0.35. On HBO, REAL TIME WITH BILL MAHER rose 0.04 to 0.35, VICE returned at 0.17, and ANIMALS dropped 0.02 to 0.06. On Lifetime, the BRING IT season finale fell 0.15 to 0.33, and ATLANTA PLASTIC returned at 0.30, with MOTHER/DAUGHTER EXPERIMENT following at 0.23. Discovery’s YUKON MEN lost 0.03 to 0.33. On Food Network, DINERS, DRIVE-INS & DIVES was at 0.31, and BURGERS, BREW & QUE held at 0.30. 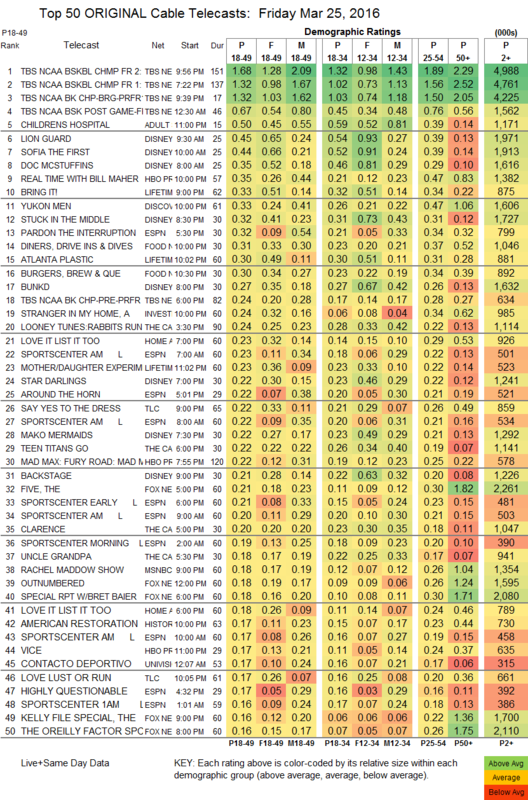 On TLC, SAY YES TO THE DRESS gained 0.03 to 0.22, but LOVE, LUST OR RUN fell 0.04 to 0.17. On History, AMERICAN RESTORATION ticked up to 0.17, and MILLION DOLLAR GENIUS rose 0.03 to 0.16. 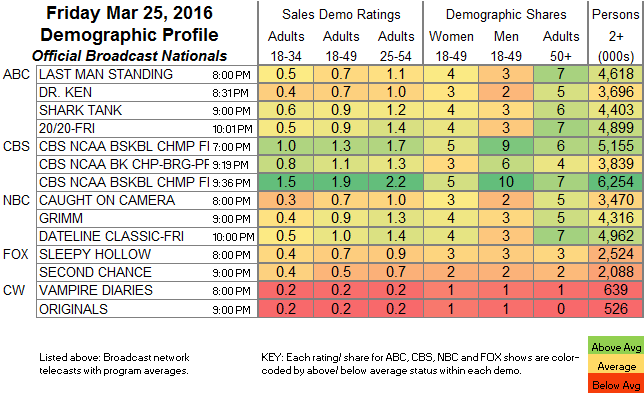 Bravo’s THE PEOPLE’S COUCH fell 0.03 to 0.12.